“Bounce on the trampoline with me, Mumma! Come on!” words that I’d hear in previous summers and make excuses for, because I knew that I’d potentially regret it. It wasn’t a majorly huge problem for me, I’d just add in a box of liners for every shop but my pelvic floor weakness meant that I wouldn’t bounce with the children, I’d cough and think “don’t, just don’t cough too much” and not be too keen on hayfever season. I’m not alone in experiencing pelvic floor weakness, 1 in 3 women do, your pelvic floor is something that’s the last thing on your mind when you bring home your new baby (or have two of your babies at home, like I did). It’s an issue that isn’t really talked about, is almost accepted as part of giving birth and then growing older. So, when I read that Restore The Floor were looking for bloggers to test their new product over months – not days or weeks – I applied and hoped I’d be chosen. 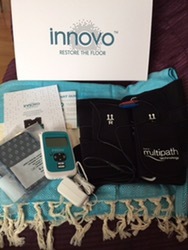 The initial questionnaire was quite detailed and I knew from this that Restore The Floor and Innovo were looking for real women, women who’d be willing to give the system a try and not just “restore the floor” but majorly increase their confidence and wellbeing too. Men can use the system too, as it’s not invasive, it’s estimated that 1 in 10 men may experience bladder issues. As you will see from the Quick Start Guide above, it’s very simple to use. 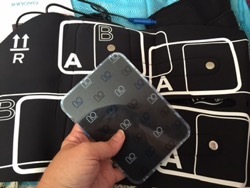 There are two wraps – one for each thigh – and the wraps come in three sizes (to fit from a size 8 to size 20+), each thigh wrap uses four gel pads, which either go onto the A or B sections, depending on your size. 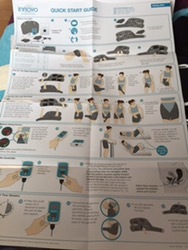 The thigh wrap has a connector which connects to hand held device. You can increase/decrease the power of the pulse via the handheld, pause it or use one of the pre-set programmes. The stipulation is that you use the device enabling skin contact with knees bent, whether this is standing with hips tilted or sitting up on the sofa or on the floor. I found it easier to have my feet up on the sofa, once you have set it up and are used to the sensation of a pulse whilst something else is working your muscles, it’s very easy to relax. It’s strange to think that your pelvic muscles are being improved from the outside in (as it were), the device contracting and relaxing the muscles 180 times each session. I was asked to use the Innovo for 30 minutes a day, 5 times a week for 12 weeks. I started out with a level 20 and within a week or so felt that I could progress up a level. The target range is 70-75 and, after 12 weeks, I’m not far off 60 so I’m very pleased. 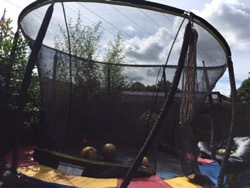 The trampoline is no longer something to fear, nor is sneezing or coughing. For long term use, it’s recommended that I use it for 1-2 sessions per week and as I know it works, that will not be a problem at all. The RRP is £249 and, although it’s not cheap, it is a far less invasive method of regaining and restoring control as opposed to surgery. The confidence boost it gives to your wellbeing is something that is hard to name a price for. The system has a two year warranty and you can also purchase replacement gel pads. The company have also set up an instalment plan for those to wish to spread payments. You can find out more about buying the system and instalments here. It’s a definite thumbs up from me, thank you Innovo!